If you’re a newbie visiting Miller Park for the first time, here are a few tips…things I definitely wished I knew in my first couple of visits to the place. Like that there’s no baseball town like Milwaukee…and there may be no better fans in baseball. 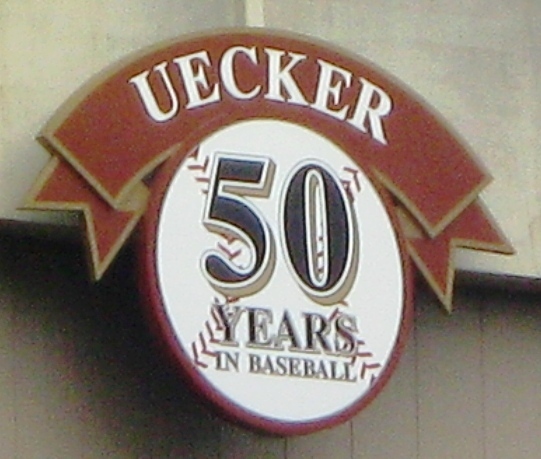 They once had a Bob Uecker Day Off in his honor. Visiting Miller Park, Tip #1: There are lots of really cheap seats. If you don’t mind missing the tailgating scene or the pre-game bars, you can get a Uecker seat on game day for just a buck; the seats are in Sections 421 and 422 and are obstructed by very large support beams, but if it’s too awful you can wander and find a good standing spot. You did get in for just a buck after all. But there’s also the Bernie’s Terrace seats that are at rock bottom prices too, partly because of the obstruction of Bernie’s slide and the distance from home plate. Again, you can still wander, and you can buy those seats in advance and take advantage of the pre-game scene without getting in a ticket line. Elevated, yet in the shade. Visiting Miller Park, Tip #2: Sit in the Loge Box for the best value. If you would prefer to nail down a decent seat, the Loge level at Miller is a great value. They’re right on top of the action, almost as if you were on the field level anyway, and equivalent seats at Yankee Stadium would probably go for quadruple the price. This is a popular spot for Brewers fans, and chances are you’ll be surrounded by some noisy ones. Is it the shuttle or the Mexican food that is the new concept? Visiting Miller Park, Tip #3: Use a shuttle or tailgate. The tailgating at Miller is like no other in baseball…long lines form at the gates well before they open, and within minutes after opening grills and tents and tables of food are set up, music is playing and corn hole games take over the lot. The Brewers even encourage it with coal bins and occasional giveaways. But if you’re not necessarily into standing outside, there are a plethora of bars and restaurants that give patrons a lift to the ballpark, and many of them get crowded and feature a great pre-game scene. There’s a dance floor at Kelly’s Bleachers, a bowling alley at J&B’s Blue Ribbon, and billiards at Steve’s on Blue Mound. Whether you’re in the parking lot or at a nearby tavern, a Brewers game is an all-day celebration. 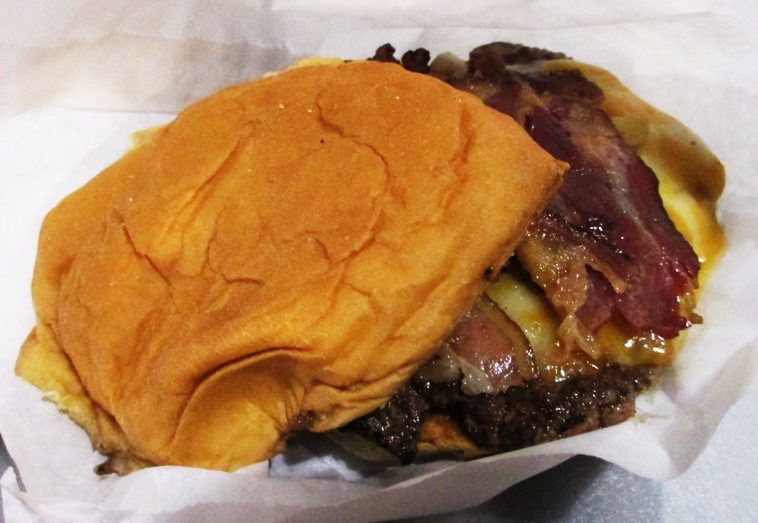 Visiting Miller Park, Tip #4: Try AJ Bombers burgers. Not knocking the bratchos, the loaded baked potatoes or the other great food items at Miller, but AJ Bombers is it for burgers…fresh burgers with rotating toppings named for Brewers players or for visiting team cities. The concretes are fantastic too. The Secret Stadium Sauce is popular at Miller, and you can’t go wrong with that on a Wisconsin brat, but check out these great Milwaukee institutions while you’re in the ballpark. Hey, no adults on the Bernie’s slide! Visiting Miller Park, Tip #5: Bring the kids. Miller Park is not only very wallet friendly, there are lots of mascots and games for kids. 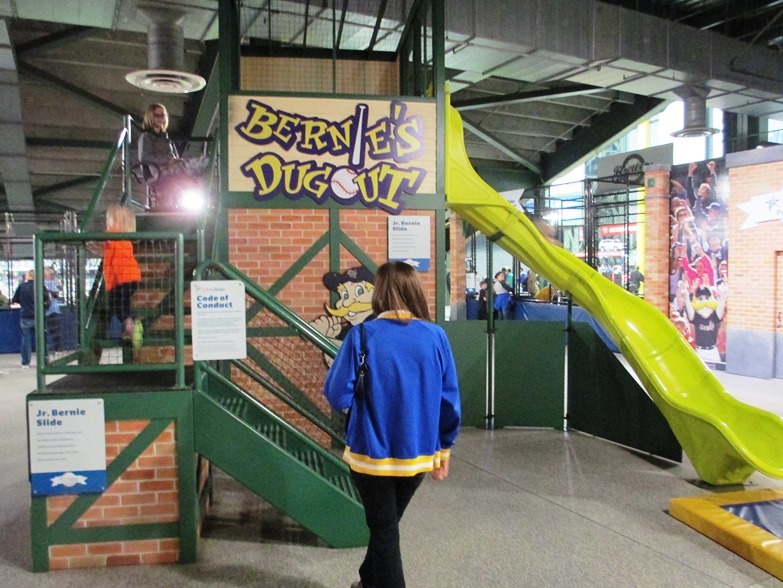 There’s the Associated Bank Kids Zone where kids can participate in a Sausage Race and sit in a huge glove, and Bernie’s Clubhouse with padded play areas for smaller kids. Not to mention all of the mascots they can pose with and the Helfaer Field playground outside of the ballpark. And of course, there’s lots of sugar in the Miller Park menu. 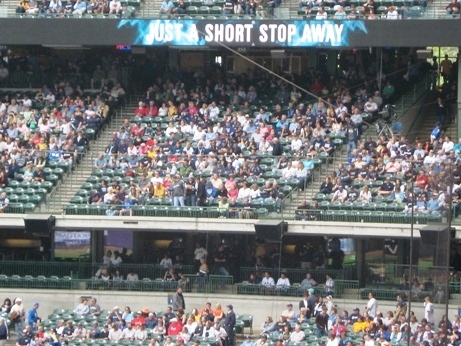 There you go, five tips for newbies visiting Miller Park in Milwaukee; although, of course I would be remiss if I forgot to mention to be in your seat in the middle of the sixth for that crazy Sausage Race. The fans love it, and you can pose with the racing sausages in the parking lot. Want to know more about Miller Park? 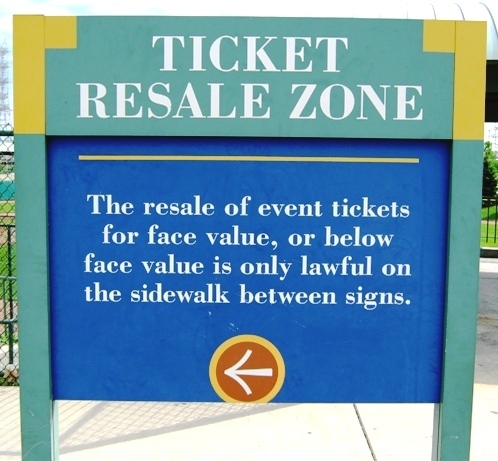 Sign up here for my completely free Miller Park e-mail newsletter series, and score some seriously valuable info about tickets, seating, transportation and food…see you at the Yard! Enjoying the cool Brewers game tips? Sign up today for the absolutely free Ballpark E-Guides Miller Park newsletter!